A cool shower design can uplift the impression of your bathroom or outdoors. A shower design influences the way water pours on your body and that may vary the degree of relaxation that one experiences in the shower. An interesting design can be created by employing some easy tricks. To create a cool shower design, make use of wooden logs and stone. You will get a rustic look and a feeling of being close to nature. Extend the stone flooring outside the shower glass and cement the wooden pillars in to the stone. Various interesting designs can be created using the wooden logs. You may use the logs horizontally, attaching them to wooden pillars in the corner. 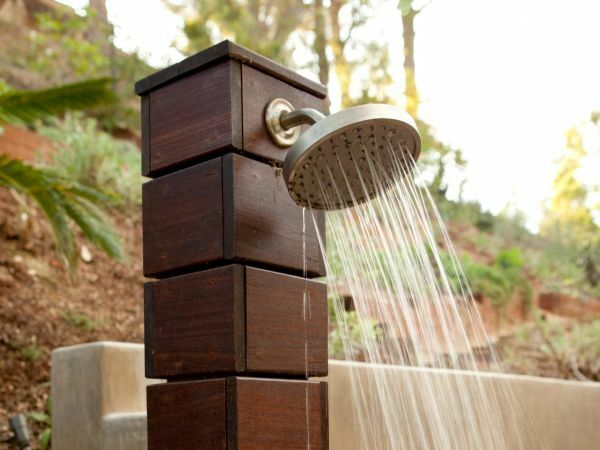 An amazing outdoor shower, the Viteo shower is portable and easy to assemble. After installing and plugging the water supply, you just need to step on it to start the water jets. The water jets rise to head level and then pour down. The disc shaped shower is big enough for a person to dance while showering. You can enjoy singing, dancing and showering in your backyard the entire summer, with the Viteo outdoor shower. The water stops to gush out as soon as you step down from it. The circular shower is a huge wheel sort of a shower, meant for the outdoors. The design of the shower is futuristic and artistic. There is large showerhead on the top and small jets of water from numerous positions pour on your body. 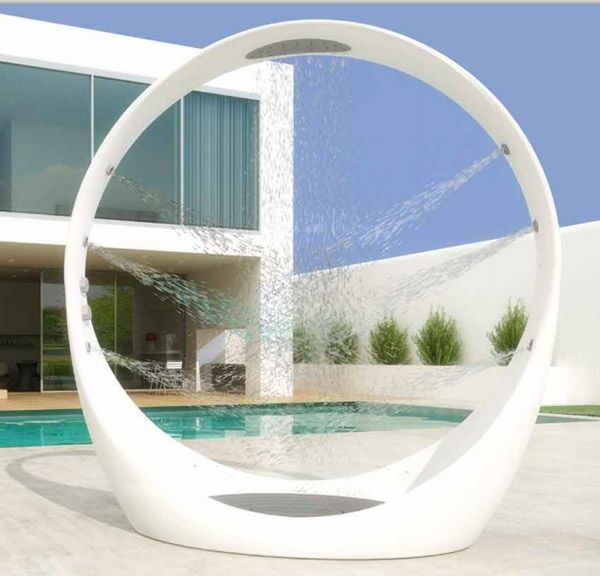 We think the shower would be most suited for the poolside; you may place it in the backyard as well. In the non-working condition, the circular shower will look like an artifact. Killing all the monotony in the world of showers, the horizontal shower is here. Why did such a smart and a simple idea skip the minds of designers for such a longtime? As they say it is never too late, you can lie down and relax in the horizontal shower. Six small showerheads would pour down water on your body. In a bathtub you are surrounded by the same water, here the water falling on you is fresh every time it touches your body. This shower will give you a never before showering experience. Choose a shower to suit your need or style. The variety of designs available means you can play around not just in designs, but also in functionality.